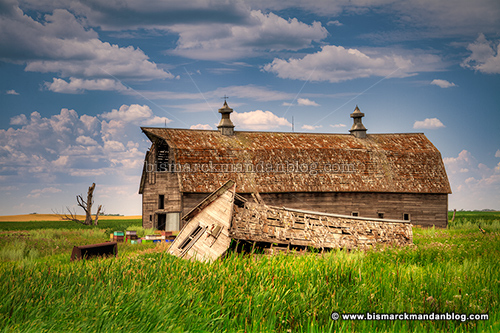 I don’t know why it struck me the way it did, but I suddenly found myself marveling at how large this barn is. It must have been quite an undertaking to build it, and I bet it was a fantastic asset when this Fallen Farm was operating in its heyday. That’s the sort of thing that, on its most basic level, enthrals so many people when they see old buildings in decay. It’s a neat journey to imagine what the structures must have been like when they were a home, a business, and a way of life. It’s remarkable what it must have taken to build them way back then, to get the materials and labor to a remote location and construct something that people would later drive by and photograph. It’s nice to wonder how the mundane had become so enchanting over the years and even generations. And, of course, to wonder how many lives had been affected by these buildings. Finally, there’s the wistful realization that these structures don’t have much time left. Many of my favorite Fallen Farms are no longer in existence. Maybe later this year I’ll feature a few. This entry was posted in Fallen Farms by Clint. Bookmark the permalink.